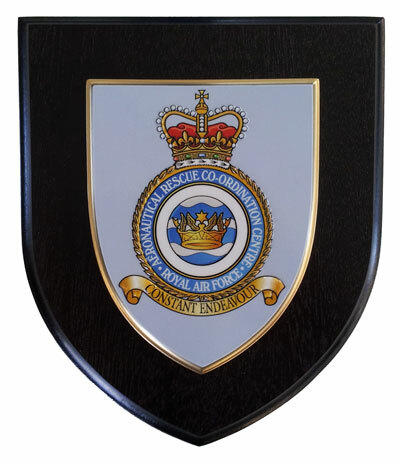 Rowan Displays are proud to have been asked to produce one hundred shields and plaques for the RAF Aeronautical Rescue Co-ordination Centre (ARCC). The RAF Search and Rescue Force was created back in 1941 when there was a need to rescue crew from ditched aircraft during the war. By the end of the Second World War it had rescued over 12 000 people, military and civilian.There were originally two control centres, in Plymouth and in Edinburgh, but these were merged in 1997 into the current centre at RAF Kinloss in Moray. The control centre is staffed by military personnel and civilians, and is responsible for coordinating search and rescue mission throughout the UK, and a large area of the North Atlantic sea. ARCC co-ordinates the RAF, Royal Navy and Maritime and Coastguard Agency Search and Rescue (SAR) helicopters, and also the Royal Air Force Mountain Rescue Service. It was originally set up to provide assistance to military personnel but in the 21st century most the requests for assistance come from the Maritime and Coastguard Agency, Police, Ambulance services, and also Air Traffic Control organisations. Apart form helicopter searches ARCC also co-ordinates overland searches and communication between ambulances, hospitals and other emergency aircraft. It monitors rescues throughout the UK and a large part of the North Atlantic sea. ARCC receives over 3600 requests for assistance every year, and offers direct assistance to over 2000 people. ARCC also hosts the UK Cospas-Sarsat Mission Control Centre (UKMCC), which is the centre that detects emergency beacons for the UK. The ARCC Coat of Arms bears the motto “Constant Endeavour”. This motto was conferred as a battle honour on Royal Air Force Coastal Command by the Air Council to mark all that its men and women did to secure the seas during in the Second World War. It is a fitting motto and Rowan Displays are very proud to have been selected to produce plaques featuring this motto and it’s coat of arms. We are also eternally graful to the people of ARCC who undetake this “Constant Endeavour” on our behalf.